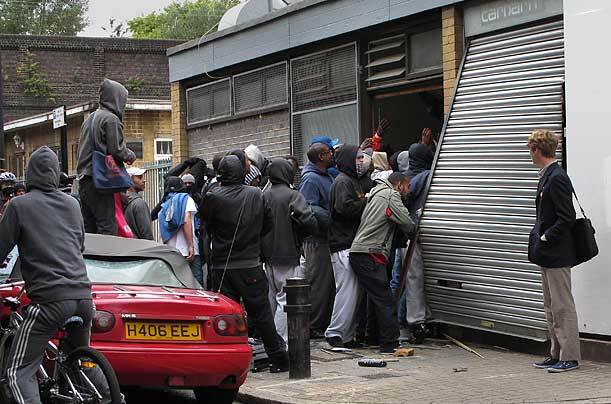 The images coming out of England in the last week should be startling to any person concerned with peace and order. 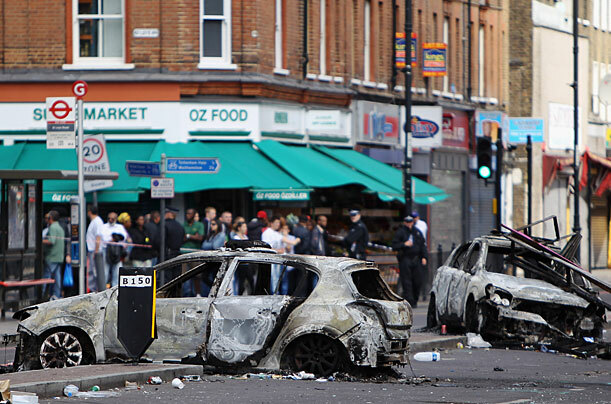 They are more reminiscent of the streets of Beirut in the 70’s, Uganda in the 80’s or Sarajevo in the 90’s than modern day London. We have have become complacent to news of violence and unrest. After all we watched it day after day this past winter as the population of one Middle East country after another rose up to depose their dictatorial leader. Make no mistake about it, this is different. This isn’t some backward Arab dictatorship or war-torn African country struggling for independence. This is England, the birthplace of the industrial civilization, orderly government and the gold standard of democracy in the world for 100’s of years. And don’t forget, England is Canada’s motherland with their Queen still acting as our head of state. The violence began last weekend as police shot and killed an Afro-Caribbean man named Mark Duggan in London’s ethnic suburb of Tottenham. The 29 year old father of 4 had been travelling in a mini-cab when he was stopped by Scotland Yard’s Operation Trident – a special police initiative dealing with drug related gun violence in black communities. Early reports said Duggan fired on police. It is now known that his loaded gun was not fired. But he was still carrying a loaded hand gun! Peaceful protests in front of the police precinct over the weekend soon turned violent as gang members showed up and began throwing fire bombs. Violence and chaos soon spread to communities all over London and England and this world class city soon turned into a war zone. Analysts are a little unclear of the exact root cause. Some are citing the government’s recent economic austerity program, some see it as merely gang related, still others as ethnically fueled. As of this writing 1200 people have been arrested, over 100 injured (mostly police) and several people are dead. There has been 100’s of millions of dollars of damage due to vandelism and stolen goods. But it is not just police clashing with gangs or anarchists. Vigilante groups of citizens are taking to the streets to protect their property and many of those groups have ended up in violent protests with police. 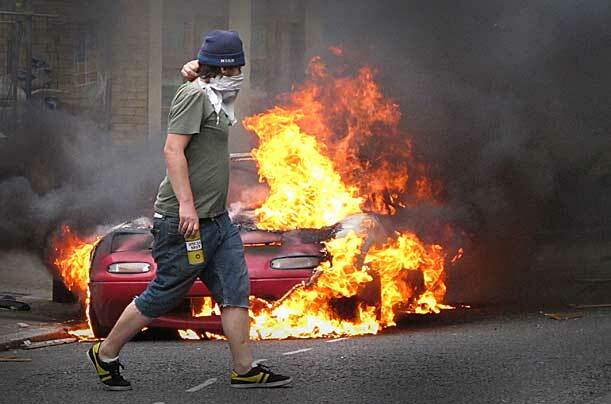 As in the Middle East, technology is playing a big part in this as riots are being organized on Facebook and Twitter. 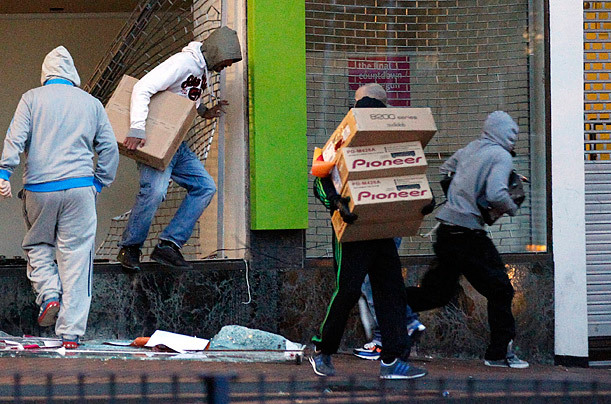 Ordinarily law abiding people are showing up and looting shops after being texted by their friends about the latest ‘fire sale’. We in Canada need to be careful about being too smug that we are somehow above all this. 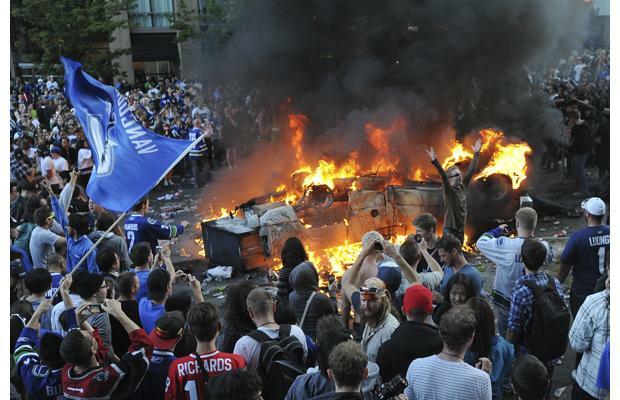 It was just a couple of months ago that the streets of Vancouver erupted into violence when the Canucks lost the Stanley Cup final on home ice in game 7. It was one of those days I was embarrassed to be a Canadian. It is just a game. It is supposed to be mere entertainment and a mindless diversion not a root of visceral anger. What is really going on here is a sign of the times. Jesus told us what to expect in the last days. What we may be witnessing in the world, and now increasingly close to home, is the lawlessness and anger predicted by Jesus himself. There is no question that one of the root causes of what we are seeing is the ethnification of our cities. ethnic groups from every nation under Heaven are flooding into the world’s major cities. But it doesn’t mean we are getting along any better. Most people groups will still pool together in ethnic community enclaves. Racial suspicions and prejudices linger right under the surface. Racial tensions have the potential at any time to become frayed and get out of hand. Most, in fact almost all violence in the world is racially motivated. But the same phenomenon that is seeing our cities all over the world becoming ethnically diverse is God’s plan for end time revival. The very passage that mentions ‘lawlessness’ abounding mentions the gospel being preached to all nations. The reality is we have not done a stellar job of taking the gospel to the nations, so God is bringing the nations to us. The hope for ethnic harmony is the same hope for all mankind’s problems – the gospel. The Gospel has the power to not only reconcile man to God, but man to man. Anarchy and violence happens when people have lost hope. The gospel is really the only hope for the world and we are the purveyors of that hope. When we see blood in the streets, it is time for us to be part of the solution not part of the problem.